"China pursues a three-step development strategy in modernizing its national defense . . . . The first step is to lay a solid foundation by 2010, the second is to make major progress around 2020, and the third is to basically reach the strategic goal of building informatized armed forces and being capable of winning informatized wars by the mid-21st century." China's leaders have stated their intentions and allocated resources to pursue broad-based military transformation to enable joint operations that encompasses force-wide professionalization; improved training; more robust, realistic joint exercises; and accelerated acquisition of modern weapons. For the moment, China's military is focused on assuring the capability to prevent Taiwan independence and, if Beijing were to decide to adopt such an approach, to compel the island to negotiate a settlement on Beijing's terms. At the same time, China is laying the foundation for a force able to accomplish broader regional and global objectives. The Intelligence Community estimates China will take until the end of this decade or later to produce a modern force capable of defeating a moderate-size adversary. In building such a capability, China's leaders stress asymmetric strategies to leverage China's advantages while exploiting the perceived vulnerabilities of potential opponents using socalled Assassin's Mace programs. The January 2007 ASAT test could be viewed in this context. The PLA's ambition to conduct joint operations can be traced to lessons learned from U.S. and Coalition operations since the 1991 Persian Gulf War. Since 2004, the PLA has conducted a number of exercises designed to develop the PLA's joint operational concepts and demonstrate new capabilities, command automation systems, and weapons. The PLA hopes eventually to fuse service-level capabilities with an integrated network for command, control, communications, computers, intelligence, surveillance, and reconnaissance (C4ISR), a new command structure, and a joint logistics system. However, it continues to face deficiencies in inter-service cooperation and actual experience in joint operations. As PLA modernization progresses, twin misperceptions could lead to miscalculation or crisis. First, other countries may underestimate the extent to which Chinese forces have improved. Second, China's leaders may overestimate the proficiency of their forces by assuming new systems are fully operational, adeptly operated, adequately maintained, and well integrated with existing or other new capabilities. In the near term, China is prioritizing measures to deter or counter third-party intervention in any future cross-Strait crises. 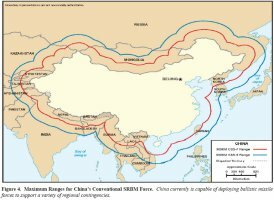 China's approach to dealing with this challenge centers on what DoD's 2006 Quadrennial Defense Review report refers to as disruptive capabilities: forces and operational concepts aimed at preventing an adversary from deploying military forces to forward operating locations, and/or rapidly destabilizing critical military balances. In this context, the PLA appears engaged in a sustained effort to develop the capability to interdict, at long ranges, aircraft carrier and expeditionary strike groups that might deploy to the western Pacific. Increasingly, China's area denial/anti-access forces overlap, providing multiple layers of offensive systems, utilizing the sea, air, and space. PLA planners have observed the primacy of precision strike in modern warfare and are investing in offensive and defensive elements of this emerging regime. China is pursuing improved ISR assets ranging from unmanned aerial vehicles, satellite constellations, and "informatized" special operations forces which could provide targeting data for long-range precision strikes when linked with robust communications. The PLA envisions precision strike capabilities sufficient to hold at risk western Pacific airbases, ports, surface combatants, land and space-based C4ISR, air defense systems, and command facilities. To prevent deployment of naval forces into western Pacific waters, PLA planners are focused on targeting surface ships at long ranges. 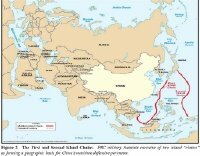 Analyses of current and projected force structure improvements suggest that in the near term, China is seeking the capacity to hold surface ships at risk through a layered defense that reaches out to the "second island chain" (i.e., the islands extending south and east from Japan, to and beyond Guam in the western Pacific Ocean). One area of apparent investment emphasis involves a combination of mediumrange ballistic missiles, C4ISR for geo-location of targets, and onboard guidance systems for terminal homing to strike surface ships on the high seas or their onshore support infrastructure. This capability would have particular significance, owing to the preemptive and coercive options it would provide China in a regional crisis. Chinese military analysts have also concluded that logistics and mobilization are potential vulnerabilities in modern warfare, given the heavy requirements for precisely coordinated transportation, communications, and logistics networks. 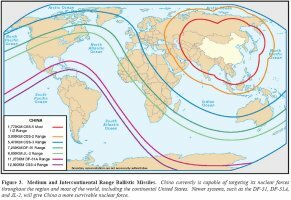 To threaten in-theater bases and logistics points, China could employ its theater ballistic missiles, land-attack cruise missiles, special operations forces, and computer network attacks. Strike aircraft, enabled by aerial refueling, could engage distant targets using air-launched cruise missiles equipped with a variety of terminal-homing warheads. Short-Range Ballistic Missiles (SRBMs) (< 1000 km). According to DIA estimates, as of October 2006 the PLA had roughly 900 SRBMs and is increasing its inventory at a rate of more than 100 missiles per year. The PLA's first-generation SRBMs do not possess true "precision strike" capability, but later generations have greater ranges and improved accuracy. Land-Attack Cruise Missiles (LACMs). China is developing LACMs for stand-off, precision strike capability against hard-targets. First- and second-generation LACMs may be deployed in the near future. Air-to-Surface Missiles (ASMs). China is believed to have a small number of tactical ASMs and precision-guided munitions, including all-weather, satellite-guided and laser-guided bombs, and is pursuing foreign and domestic acquisitions to improve airborne anti-ship capabilities. Anti-Ship Cruise Missiles (ASCMs). PLA Navy has or is acquiring nearly a dozen varieties of ASCMs, from the 1950s-era CSS-N-2/STYX to the modern Russian-made SS-N-22/SUNBURN and SS-N- 27B/SIZZLER. The pace of indigenous ASCM research, development and production - and of foreign procurement - has accelerated over the past decade. Anti-Radiation Weapons. The PLA has imported Israeli-made HARPY UCAVs and Russian-made antiradiation missiles, and is developing an anti-radiation missile based on the Russian Kh-31P (AS-17) known domestically as the YJ-91. Artillery-Delivered High Precision Munitions. The PLA is deploying the A-100 300 mm multiple rocket launcher (MRL) (100+ km range) and developing the WS-2 400 mm MRL (200 km range). Additional munitions are being fielded or are under development. Advanced mines, submarines, maritime strike aircraft, and modern surface combatants equipped with advanced ASCMs would provide a supporting layer of defense for its long-range anti-access systems. Acquisition of the KILO, SONG, SHANG, and YUAN-class submarines illustrates the importance the PLA places on undersea warfare. The purchase of SOVREMENNYY II-class DDGs and indigenous production of the LUYANG I/ LUYANG II DDGs equipped with long-range ASCM and SAM systems demonstrate a continuing emphasis on improving anti-surface warfare, combined with mobile, wide-area air control. PLA air defense has shifted from point defense of key military, industrial, and political targets to a new Joint Anti-Air Raid Campaign based on a modern, integrated air defense system and offensive and defensive counter-air operations. These operations extend beyond the defense of Chinese airspace to include strikes against an adversary's bases (including aircraft carriers) and logistics to degrade the adversary's ability to conduct air operations. The air defense component of anti-access/areadenial includes SAMs such as the SA-10, SA-20, HQ-9, HQ-15, and extended-range C2 suites such as the S-300PMU2. Beijing will also use Russian-built and domestic fourth-generation aircraft (e.g., Su-27 and Su-30 FLANKER variants, and the indigenous F-10). The PLA Navy would employ recently acquired Russian Su-30MK2 fighters, armed with AS-17/Kh-31A anti-ship missiles. The acquisition of refueling aircraft, including the Russian IL- 78/MIDAS and the indigenously developed B-6U refueling aircraft, will extend operational ranges for PLAAF and PLA Navy strike aircraft armed with precision munitions, thereby increasing the threat to surface and air forces distant from China's coast. Additionally, acquisition of UAVs and UCAVs, including the Israeli HARPY, expands China's options for long-range reconnaissance and strike. A final element of an emerging area denial/anti access strategy includes the electromagnetic, or information, sphere. PLA authors often cite the need in modern warfare to control information, sometimes termed an "information blockade." China is pursuing this ability by improving information and operational security, developing electronic warfare and information warfare capabilities, and denial and deception. China's concept of an "information blockade" likely extends beyond the strictly military realm to include other elements of state power. Secrecy, information controls (including internet security), and propaganda remain hallmarks of CCP rule. In 2006, several independent researchers used a U.S.-based commercial imagery service provider's archive of overhead imagery to identify several Chinese military-related facilities including a submarine base, a facility that appeared to replicate a contested portion of the Sino-Indian border, and a mock Taiwan airfield. Shortly after the publication of these studies, Chinese state-run media in August 2006 claimed that foreign map makers had illegally surveyed Chinese territory and threatened China's security. The article referenced China's 2002 Surveying and Mapping Law and quoted the PRC State Bureau of Survey and Mapping as stating that "foreigners who illegally survey, gather and publish geographical information on China will be severely punished." This sequence of events may indicate that China is attempting to lay the groundwork to extend the concept of the "information blockade" into space. Nuclear Deterrence. China is qualitatively and quantitatively improving its legacy strategic forces. These presently consist of approximately 20 silo-based, liquid-fueled CSS-4 ICBMs (which constitute its primary nuclear means of holding continental U.S. targets at risk), approximately 20 liquid-fueled, limited range CSS-3 ICBMs, between 14-18 liquid-fueled CSS-2 intermediate range ballistic missiles (IRBMs) and upwards of 50 CSS-5 road mobile, solid-fueled medium range ballistic missiles (MRBMs) (for regional deterrence missions), and JL-1 SLBMs on the XIA-class SSBN. By 2010, China's strategic nuclear forces will likely comprise a combination of enhanced CSS-4s; CSS-3s; CSS-5s; solid-fueled, road-mobile DF-31s (which achieved initial threat availability in 2006, and will likely achieve operational status in the near future, if it has not already done so), and DF- 31A ICBMs (expected IOC in 2007); and the JL-1 and JL-2 SLBMs (expected IOC between 2007- 10). The addition of the DF-31 family of missiles and the JL-2 and JIN-class SSBNs will give China a more survivable and flexible nuclear force. New air- and ground-launched cruise missiles that could perform nuclear missions will similarly improve the survivability and flexibility of China's nuclear forces. China's 2006 Defense White Paper states that: 1) the purpose China's nuclear force is to "deter other countries from using or threatening to use nuclear weapons against China;" 2) China "upholds the principles of counterattack in self-defense and limited development of nuclear weapons;" and, 3) China "has never entered into and will never enter into a nuclear arms race with any other country." The paper reiterated China's commitment to a declaratory policy of "no first use of nuclear weapons at any time and under any circumstances," and states China "unconditionally undertakes not to use or threaten to use nuclear weapons against non-nuclear-weapon states or nuclear weapon-free zones." Doctrinal materials suggest additional missions for China's nuclear forces include deterrence of conventional attacks against the Chinese mainland, reinforcing China's great power status, and increasing its freedom of action by limiting the extent to which others can coerce China. China's assertion of a nuclear "no first use" policy, therefore, is ambiguous. This ambiguity is compounded with the juxtaposition of the "no first use" declaration and the stated commitment to adhere to the principle of "counter attack in self defense." Periodic military and civilian academic debates over the future of China's nuclear doctrine have questioned whether or not a "no first use" policy supports or detracts from China's deterrent, and whether or not "no first use" should remain in place. The Chinese government has provided public and private assurances that its "no first use" policy has not and will not change. Nevertheless, coupled with the debates themselves, the introduction of more capable and survivable nuclear systems in greater numbers suggest Beijing may be exploring the implications of China's evolving force structure, and the new options that force structure may provide. Space and Counterspace. China's space activities and capabilities, including anti-satellite programs, have significant implications for anti-access/area denial in Taiwan Strait contingencies and beyond. China further views the development of space and counter-space capabilities as bolstering national prestige and, like nuclear weapons, demonstrating the attributes of a world power. China has accorded space a high priority for investment. Premier Wen Jiabao, marking the 50th anniversary of China's aerospace industry in October 2006, stated that "China's aerospace industry is standing at a new starting point and facing a new situation and tasks." It is now necessary, he said, "to implement the principle of independent innovations, leaps in key areas . . . carry out major state science and technology special projects in manned space flights and a lunar probe, and achieve new breakthroughs in research and development [of] aerospace equipment and . . . space technology." Reconnaissance. China is deploying advanced imagery, reconnaissance, and Earth resource systems with military applications. Examples include the CBERS-1 and -2 satellites and the Huanjing disaster/environmental monitoring satellite constellation. China is planning eleven satellites in the Huanjing program capable of visible, infrared, multi-spectral, and synthetic aperture radar imaging. In the next decade, Beijing most likely will field radar, ocean surveillance, and high-resolution photoreconnaissance satellites. In the interim, China probably will rely on commercial satellite imagery (e.g., SPOT, LANDSAT, RADARSAT, and Ikonos) to supplement existing coverage. Navigation and Timing. China has launched four BeiDou satellites with an accuracy of 20 meters over China and surrounding areas. China also uses GPS and GLONASS navigation satellite systems, and has invested in the EU's Galileo navigation system. Manned Program.In October 2005, China completed its second manned space mission and Chinese astronauts conducted their first experiments in space. Press reports indicate China will perform its first space walk in 2007-2008, and rendezvous and docking in 2009-2012. China's goal is to have a manned space station by 2020. Communications. China uses foreign providers, like INTELSAT and INMARSAT, for communications, but is expanding indigenous capabilities in this area. China may be developing a system of data relay satellites to support global coverage, and has reportedly acquired mobile data reception equipment that could support more rapid data transmission to deployed military forces and units. Small Satellites. Since 2000, China has launched a number of small satellites, including an oceanographic research, imagery, and environmental research satellites. China has also established dedicated small satellite design and production facilities. China is developing microsatellites - weighing less than 100 kilograms - for remote sensing, and networks of imagery and radar satellites. These developments could allow for a rapid reconstitution or expansion of China's satellite force in the event of any disruption in coverage. Anti-Satellite (ASAT) Weapons.In January 2007, China successfully tested a direct-ascent ASAT missile against a Chinese weather satellite, demonstrating its ability to attack satellites operating in low-Earth orbit. The direct ascent ASAT system is one component of a multi-dimensional program to generate the capability to deny others access to outer space. [The] goal of a space shock and awe strike is [to] deter the enemy, not to provoke the enemy into combat. For this reason, the objectives selected for strike must be few and precise . . .[for example] on important information sources, command and control centers, communications hubs, and other objectives. This will shake the structure of the opponent's operational system of organization and will create huge psychological impact on the opponent's policymakers. China's nuclear arsenal has long provided Beijing with an inherent ASAT capability. However, in recent years Beijing has pursued a robust, multidimensional counterspace program. UHF-band satellite communications jammers acquired from Ukraine in the late 1990s and probable indigenous systems give China today the capacity to jam common satellite communications bands and GPS receivers. In addition to the direct ascent ASAT program demonstrated in January 2007, China is also developing other technologies and concepts for kinetic (hit-to-kill) weapons and directed-energy (e.g., lasers and radio frequency) weapons for ASAT missions. Citing the requirements of its manned and lunar space programs, China is improving its ability to track and identify satellites - a prerequisite for effective, precise physical attacks. [The] mechanism to get the upper hand of the enemy in a war under conditions of informatization finds prominent expression in whether or not we are capable of using various means to obtain information and of ensuring the effective circulation of information; whether or not we are capable of making full use of the permeability, sharable property, and connection of information to realize the organic merging of materials, energy, and information to form a combined fighting strength; [and,] whether or not we are capable of applying effective means to weaken the enemy side's information superiority and lower the operational efficiency of enemy information equipment. The PLA is investing in electronic countermeasures, defenses against electronic attack (e.g., electronic and infrared decoys, angle reflectors, and false target generators), and computer network operations (CNO). China's CNO concepts include computer network attack, computer network defense, and computer network exploitation. The PLA sees CNO as critical to achieving "electromagnetic dominance" early in a conflict. Although there is no evidence of a formal Chinese CNO doctrine, PLA theorists have coined the term "Integrated Network Electronic Warfare" to prescribe the use of electronic warfare, CNO, and kinetic strikes to disrupt battlefield network information systems. The PLA has established information warfare units to develop viruses to attack enemy computer systems and networks, and tactics and measures to protect friendly computer systems and networks. In 2005, the PLA began to incorporate offensive CNO into its exercises, primarily in first strikes against enemy networks. In a speech at the March 2006 National People's Congress, PLA Chief of the General Staff Liang Guanglie stated that "one must attend to the effective implementation of the historical mission of our forces at this new stage in this new century. . . preparations for a multitude of military hostilities must be done in concrete manner, [and] . . . competence in tackling multiple security threats and accomplishing a diverse range of military missions must be stepped up." Consistent with this guidance, China continues to invest in military programs designed to improve extended-range power projection. Current trends in China's military capabilities are a major factor in changing East Asian military balances, and could provide China with a force capable of prosecuting a range of military operations in Asia - well beyond Taiwan. Given the apparent absence of direct threats from other nations, the purposes to which China's current and future military power will be applied remain unknown. It is certain, however, that these capabilities will increase Beijing's options for military coercion to press diplomatic advantage, advance interests, or resolve disputes. If Taiwan should be alienated from the mainland, not only [would] our natural maritime defense system lose its depth, opening a sea gateway to outside forces, but also a large area of water territory and rich resources of ocean resources would fall into the hands of others. . . .[O]ur line of foreign trade and transportation which is vital to China's opening up and economic development will be exposed to the surveillance and threats of separatists and enemy forces, and China will forever be locked to the west of the first chain of islands in the West Pacific. China's 2006 Defense White Paper similarly raises concerns about resources and transportation links when it states that "security issues related to energy, resources, finance, information, and international shipping routes are mounting." The related desire to protect energy investments in Central Asia and could also provide an incentive for military investment or intervention if instability surfaces in the region. Disagreements that remain with Japan over maritime claims and with several Southeast Asian claimants to all or parts of the Spratly Islands in the South China Sea could lead to renewed tensions in these areas. Instability on the Korean Peninsula likewise could produce a regional crisis in which Beijing would face a choice between a diplomatic or a military response. Analysis of China's weapons acquisitions also suggests China is looking beyond Taiwan as it builds its force. For example, new missile units outfitted with conventional theater-range missiles at various locations in China could be used in a variety of non-Taiwan contingencies. Airborne early warning and control and aerial-refueling programs will permit extended air operations into the South China Sea. Advanced destroyers and submarines reflect Beijing's desire to protect and advance its maritime interests. Expeditionary forces (three airborne divisions, two amphibious infantry divisions, two marine brigades, about seven special operations groups, and one regimental-size reconnaissance element in the Second Artillery) are improving with the introduction of new equipment, better unit-level tactics, and greater coordination of joint operations. Over the long term, improvements in China's C4ISR, including space-based and over-the-horizon sensors, could enable Beijing to identify, track and target military activities deep into the western Pacific Ocean. Finally, analysis of PLA training activities provides an additional indication that the PLA is exploring contingencies other than Taiwan. For example, the July-August 2006 North Sword-07, a simulated, opposing-forces exercise, involved for the first time two fully equipped PLA divisions with the support of the air force, Second Artillery Corps, and the People's Armed Police. The exercise focused on long-distance maneuver, intelligence acquisition, and mobile counterattack operations. "Tianshan-1 2006," a bilateral exercise with Kazakhstan in August 2006, which took place in Almaty, Kazakhstan and Yining, China improved cooperation between law enforcement and security departments. "Cooperation 2006," a bilateral exercise with Tajikistan in September 2006, featured 150 troops from China and 300 troops from Tajikistan in a scenario for coordinated responses to terrorist attacks. In October 2006, Lieutenant General Wang Zhiyuan, vice chairman of the Science and Technology Commission of the PLA's General Armament Department stated that the "Chinese army will study how to manufacture aircraft carriers so that we can develop our own . . . . [A]ircraft carriers are indispensable if we want to protect our interests in oceans." China first began to discuss developing an indigenous aircraft carrier in the late 1970s. In 1985, China purchased the Australian carrier the HMAS Melbourne. Although the hull was scrapped, Chinese technicians studied the ship and built a replica of its flight deck for pilot training. China purchased two former Soviet carriers - the Minsk in 1998 and the Kiev in 2000. Neither carrier was made operational; instead, they were used as floating military theme parks. Nevertheless, both provided design information to PLA Navy engineers. In 1998 China purchased the ex-Varyag, a Kuznetsov-class Soviet carrier that was only 70 percent complete at the time of the Soviet Union's collapse. Recent deck refurbishment, electrical work, fresh hull paint with PLA Navy markings, and expressed interest in Russia's Su-33 fighter has re-kindled debate about a Chinese carrier fleet. The PLA's ultimate intentions for the Varyag remain unclear, but a number of possibilities exist: turning it into an operational aircraft carrier, a training or transitional platform, or a floating theme park - its originally-stated purpose. Regardless of Beijing's final objective for the ex-Varyag, PLA Navy study of the ship's structural design could eventually assist China in creating its own carrier program. Lieutenant General Wang stated that, "we cannot establish a real naval force of aircraft carriers within three or five years." Some analysts in and out of government predict that China could have an operational carrier by the end of the 12th Five- Year Plan (2011-2015); others assess the earliest it could deploy an operational aircraft carrier is 2020 or beyond.